Charles Courtice Pounds began his career as a singer. Born in London, he studied music at various academies and institutions and his first stage appearance was in 1881 in the chorus of Gilbert and Sullivan’s Patience. Not until 1901 at His Majesty’s Theatre did he play a part in Shakespeare, as Feste in Twelfth Night. That same year he played Touchstone at the Prince’s Theatre in Manchester; in 1902 he played in The Merry Wives of Windsor. 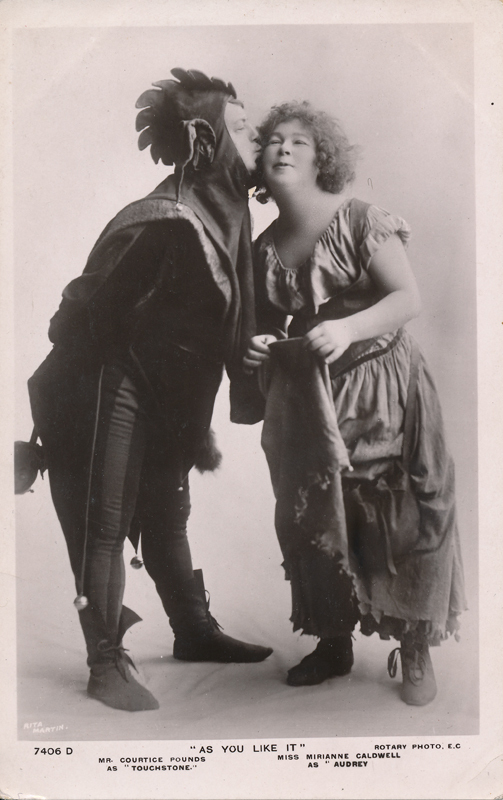 His ability as a Shakespearean is attested to by his being asked to perform his Touchstone and other parts in the 1907 Shakespeare Festival in London at His Majesty’s Theatre. He returned later in his career to the musical theatre where he played the part of Ali Baba for nearly five years in Oscar Asche‘s Chu Chin Chow. In 1922 he starred in one of his most memorable roles as Franz Schubert in Lilac Time.